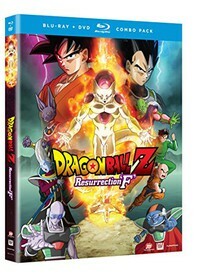 Dragon Ball Z: Resurrection 'F' is the second Dragon Ball film personally supervised by the series creator Akira Toriyama, following Battle of Gods. The new movie showcases the return of Frieza – one of the anime world's greatest villains. Frieza has been resurrected and plans to take his revenge on the Z-Fighters of Earth. Goku and Vegeta must reach new levels of power in order to protect Earth from their vengeful nemesis. Special Features: The Voices of Dragon Ball Z: Picture-in-Picture Making Of Footage, The Return of Dragon Ball Z: Cast Interviews & Red Carpet Footage.